Wow. I’m not even sure how to start this post. Begin at the beginning I guess? Before I do, here’s the very short version: Tristan has a pedal fracture of the coffin bone that is badly infected and likely has been for some months. He will have surgery for it on March 4, a week from Monday, and if that goes well he has a very good chance of returning to riding sound. Item #1 on my to do list came back quickly. My vet heard from the consulting radiologist first thing in the morning on Thursday and called me at around 10:30. She told me his findings: pedal fracture, with infection and bone loss. Tris would need to start on antibiotics ASAP, and would get a hospital plate put on in the next few days while we tried to decide – with more consultants’ help – if he would need surgery. Along the dorsolateral solar margin, there is a triangular, moderate sized fracture fragment. The margins of the distal distal phalanx are moderately irregular. A focal area of osteolysis is present, medial to the osseous fragment. Smaller rounded osseous fragments are present along the lateral solar margins A long toe conformation is present that is slightly concave along the distal dorsal aspect. There is a small amount of gas tracking between the sensitive and insensitive laminae. 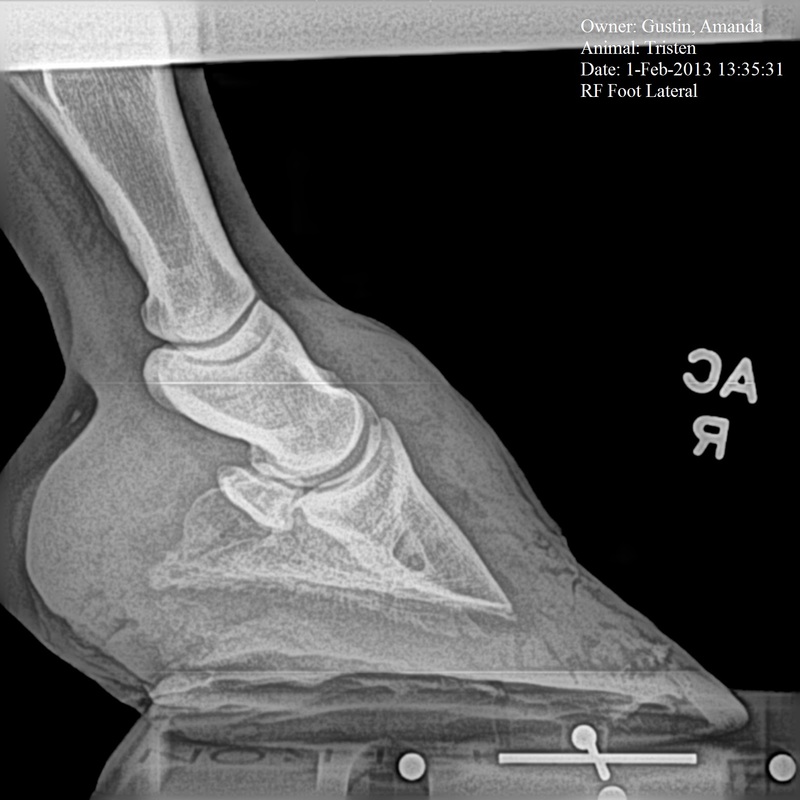 The navicular bone is within normal limits. The remaining osseous and soft tissue structures are radiographically normal. Here’s the view that made him say that. You can see the triangular fracture fragment pretty easily in this picture, as well as the irregular margins. Osteolysis is a fancy word for bony changes, which you can see between the fragment and the rest of the coffin bone. The “smaller rounded osseous fragments” are bone chips. Long toe and concavity is something we knew we had, and that’s been present practically since day one of the abscess. 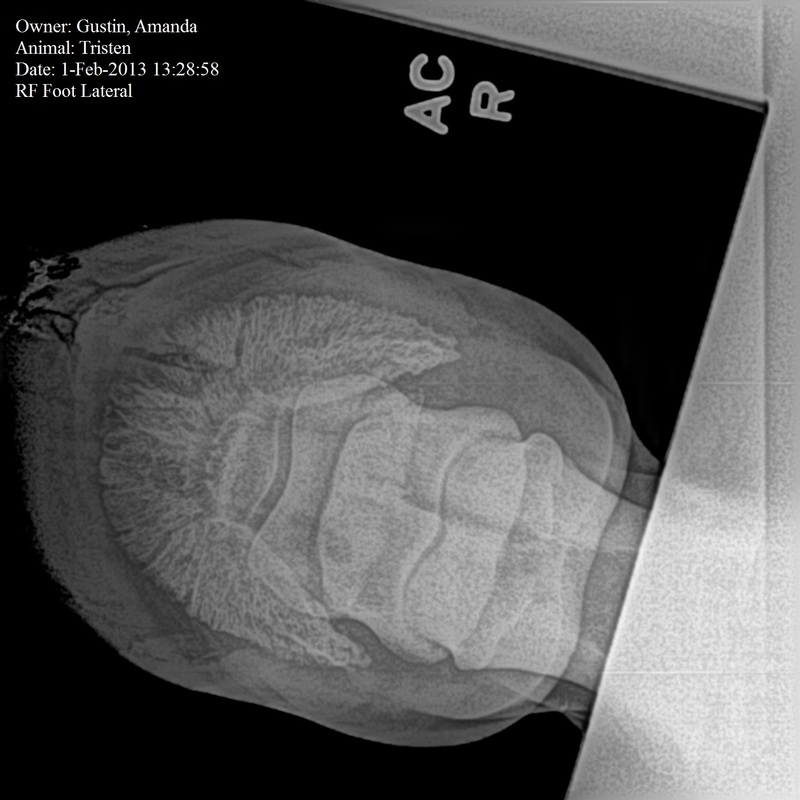 The gas tracking is also due, presumably, to the massive hole of the abscess. You can see both in this side view. This view was taken before a second, more aggressive trim of the toe that we did based on the x-ray, so the long toe was corrected. Finally: hip hooray for everything else looking ok! I sent off the x-rays from June and September and the radiologist saw the pedal fracture on both. He also guessed that the infection in the coffin bone has been going on for some time, based on the amount of bone loss. Which leads to the chicken or the egg question: did he abscess because of the fracture & infection, or did the infection come only with the abscess, or was the abscess incidental and confusing? I drove out to the vet’s house Thursday night and picked up the antibiotics – enrofloxacin, trade name Baytril, which seemed a good combination of easy to dose, easy on his body, and broad-spectrum enough to fight the infection and get down into his foot. I stopped by the barn afterward to leave the drugs, dosing instructions, etc., and to cry all over him. Friday afternoon I heard back from the vet, who had a long talk with the surgeon at the Vermont Large Animal Clinic in Milton, VT. They recommended surgery without question, and offered to take him the next day – Saturday morning. The vet was headed out of town the following week but would be back and take him first thing the day he got back, Monday, March 4. My vet said she felt comfortable with his diagnosis, liked him enormously as a surgeon, and sent me the original files of everything so I could send them down to Tufts to get a second opinion, just to be neurotic. I trust her enough that I have made the appointment at VLAC and spent about half an hour talking to the surgeon’s intern (who has discussed the case with the surgeon, who was not available at that moment), who was extremely nice and able to answer all my questions. VLAC wants him to go home in a boot, so I called the EasyCare company and they recommended their EasyBoot Rx. I’ll measure him tomorrow and order them first thing Monday morning. I did email VLAC back to gently question the boot v. hospital plate aftercare, as everything I’m reading (I know, I know, armchair owner) recommends immobilizing the foot with a hospital plate instead. He’ll go in at 1pm on Monday, and stay overnight. I’ll bring him home on Tuesday. He’ll have a minimum of 6 to 8 weeks stall rest while he heals. The good news is that he has a decent chance of coming sound enough for riding if the surgery is successful, and they’ve done this surgery before and are confident in it.